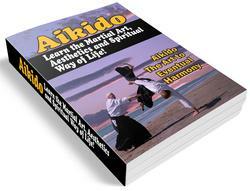 Often Aikidoists should supplement their Dojo training with practice at home. The exercises I am giving here are for you to practise by yourself for the purpose of building your Ki power, movement and balance. They are also good for relaxing your mind. Stand in left Hamni posture, your hands having the feeling of pushing down and out. Step forward, with your right foot turning at the same time. Repeat with your left so that now you are in the reverse position. Do not stop dead. Repeat the movement. Keep this movement going so that you build up a smooth and fast movement. On no account jump when you are doing this exercise. Keep your centre of gravity down. In the next exercise take the posture of left Hamni. Now with your arms pushing forward and your fingers open and stretched out, keep the small of your back straight, shoulders relaxed and head upright. 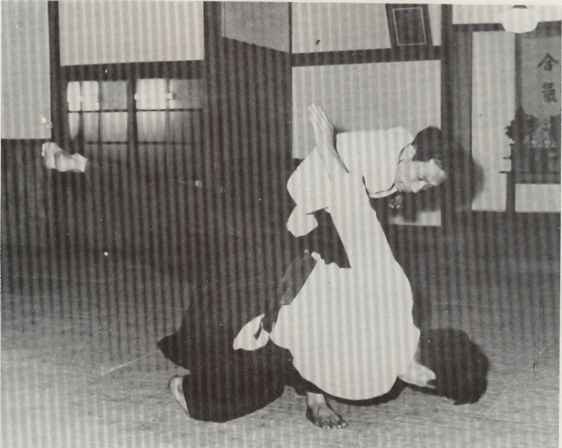 As you push forward with your arms slide slightly forward and bring them back to your side. Keep doing this until you can get someone to test you by standing in front of you when you push out. See if they can push you back by holding your wrist. Practise this exercise on both sides.